While many know and fondly remember John Boyega as Moses in Attack the Block, he really became part of the pop culture conversation when he took on the role of Finn in the massive blockbuster sequel Star Wars: The Force Awakens. Now, he takes on yet another epic sci-fi franchise with Pacific Rim: Uprising, coming to theaters in 2018. It is a direct follow-up to Guillermo Del Toro's original 2013 adventure which pitted giant monsters and robots in a fight to the death. Today, we have a photo from the set of Pacific Rim 2, which shows John Boyega in costume, confirming his role as a Jaegar Pilot. The Instagram user who posted this photo wasn't sure if she was actually looking at Boyega or his stunt double, but it has since been confirmed that this is indeed Finn in the flesh. Boyega was earlier confirmed to be playing son to Idris Elba's Stacker Pentecost, who's heroic acts saved the day in that first outing. The younger Pentecost will now have to carry on the heavy burden of his deceased dad's legacy. At the time of John Boyega's casting, it wasn't mentioned whether or not he'd be climbing into a Jaeger himself. But this photo clearly gives us that answer. This set photo is interesting in that it also gives us our first look at the redesigned and updated Jaeger armor that will be worn in the movie. Right now, the story behind Pacific Rim: Uprising is being kept under lock and key. And it's previously been stated that the big monsters will be quite a bit different this next time around, with a whole new threat looming on the horizon. Boyega's co-pilot hasn't been announced yet. But Scott Eastwood has taken on a key role in the movie, and could fulfill that role. 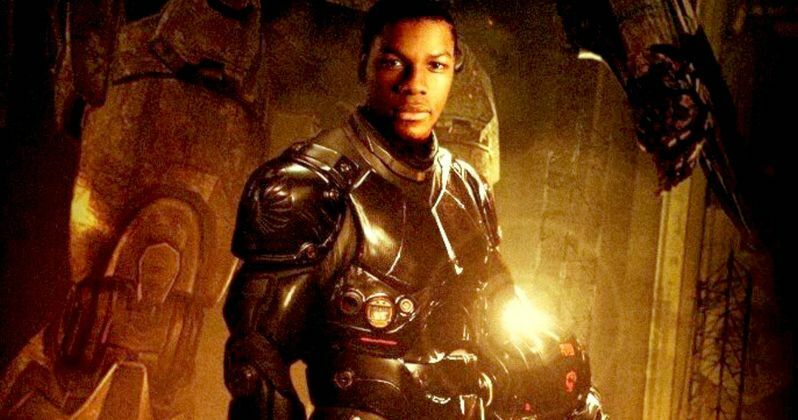 John Boyega jumped directly into shooting Pacific Rim 2 after finishing Star Wars 8. And when he is done here, he will go back to England to start Star Wars 9, finishing that trilogy. No further details about Pacific Rim have been released at this time. The original Pacific Rim lore states that long ago, legions of monstrous creatures called Kaiju arose from the sea, bringing with them all-consuming war. To fight the Kaiju, mankind developed giant robots called Jaegers, designed to be piloted by two humans locked together in a neural bridge. However, even the Jaegers are not enough to defeat the Kaiju, and humanity is on the verge of defeat. Mankind's last hope now lies with a washed-up ex-pilot (Charlie Hunnam), an untested trainee (Rinko Kikuchi) and an old, obsolete Jaeger. A full cast list for Pacific Rim 2 hasn't been announced. You can take a look at John Boyega on set here.